(Seychelles News Agency) - The Seychelles’ Ministry of Environment has described as alarming the rate by which a new algae is spreading and threatening the island nation's marine life, an issue the tourism industry is keeping a worried and wary eye on. The algae confirmed as a species in the genus of hypnea, has never been recorded in the island nation. The director general for Biodiversity Conservation and Management Division in the Ministry of Environment, Marie May Muzungaille, told SNA on Tuesday that sightings of these large mats of seaweed that washed onto beaches were first recorded in June this year. “We had some records at Port Launay on the west coast of Mahe. However most of the issues have arisen on Praslin, Cote Dor area where there has been many sightings and complaints,” said Muzungaille. The Ministry of Environment, Energy and Climate Change has been liaising with different partners, particularly scientists, to identify this species. “This red algal species often turns greenish which can give the impression that is a different species. This is of concern to the ministry and our partners because species of this genus have been known to form plaques on coral reef ecosystems where they attack. This non-native species can be quite invasive if allowed to establish in our reef system,” explained Muzungaille. The area most affected by the algae is the Cote Dor area on the east side of Praslin – the second most populated island of the Seychelles. The area is highly frequented with many tourism establishments. 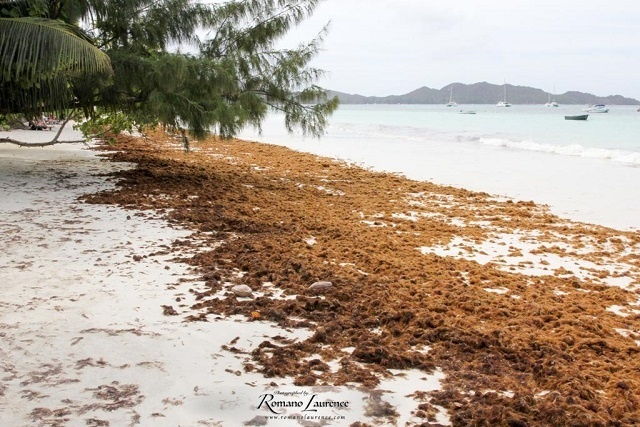 The director of Le Duc de Praslin – a hotel in the area - Robert Payet said that the algae is disastrous for tourism as the whole beach is covered with the seaweed which produces a foul smell. “We are calling for action from the government because this is a disaster, not only for us on Praslin but for the whole country as well. Just imagine visitors posting photos of the state of our beaches on social media,” said Payet. It is normal to see an increase in the accumulation of algae during the current monsoon. This happens on a large-scale during the south-east monsoon -- May to October -- when the sea is rough, and the algae are torn from the seabed and end up in piles on the beach. But the accumulation of this type of algae is worse than what is normally seen. According to the Ministry for Environment, “the main assumption is that these would have been brought up through ocean currents since they are not occurring in large areas of the reef systems in the inner islands." Muzungaille adds that the ministry is getting support and advise from David Rowatt – a scientist from Marine Conservation Society of Seychelles - on this. “At this point, we need to establish whether this is an issue only on the inner islands or is it also on the outer island. We need to understand whether it is seasonal or is it here to stay. We will be looking into this further to set a clear way on how to deal with the issue,” explained the director general. For now, there is not much that it is being done except for daily cleaning and removal of the algae. The Landscape and Waste Management Agency, which issues contracts for beach cleanings said dealing with the algae manually is arduous. “If we had the right equipment like a specialized machinery to collect the seaweed, the clean-up would have been done more efficiently as doing it manually is difficult due to the thickness of the deposition,” said Mark Francois. More contractors have been dispatched to help clean the large mats on the beaches of Praslin. As this will prevent it from being washed back out to sea and prevent further spreading. 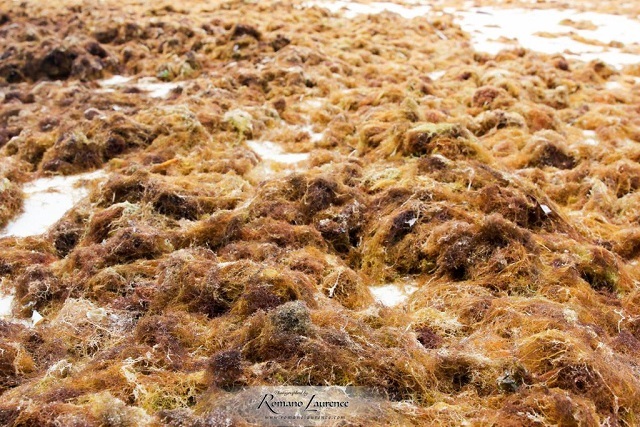 A Praslin based factory Seaweed Seychelles – which is turning seaweed into agricultural fertiliser – said that due to lack of space the factory cannot collect the algae to see if same can be dried and turned into fertiliser.